or toll-free 1.888.55.SAMCO (72626) or email us. The Heidelberg QMDI PRO waterless offset press eliminates the burdensome and often time-consuming steps in making films and off-line plates thereby reducing sources of error and possible loss of quality sometimes inherent in the analogue process. Unlike DTP (Direct to Plate) or CTP (Computer to Plate) where digital data is imaged to offline plates, the QMDI PRO images directly to plates on press without the use of harmful chemistry, thus saving time, producing less waste and ensuring perfect registration on all printing units. The elimination of film and reduction of make-ready time significantly reduces set-up costs, produces less waste and makes short run four colour offset printing economical. You no longer need to print large quantities to bring unit costs within reach. With the built-in infrared dryer, the QMDI PRO provides the same convenience and turnaround times of toner based systems. The high-end stream feeder and online plate imaging on the QMDI PRO provide exact colour-to-colour and sheet-to-sheet registration so critical for 5th, 6th colour or off-line processes like embossing, die-cutting and foiling. This revolutionary technology, eliminates the need for solvent-based press and blanket wash solutions, which typically account for a large portion of a printer’s volatile organic compounds (VOC) output. The press wash solution is 93 percent water and 7 percent mild surfactant (soap), with the ultimate goal of a 100 percent water-washable product. The environmental benefits of water-washable inks are far reaching. Because presses running waterless come up to colour and register so much faster, and hold those consistently throughout the press run, paper savings of 30 percent to 40 percent have been reported. In addition to saving trees, that also represents a significant manufacturing and paper cost savings. Waterless printing enables us to achieve higher ink densities that expand the colour gamut and produce more saturated colour. The chart on the right shows the CIE hue measurements taken from three different press sheets. 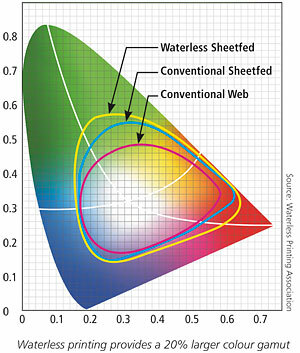 DI waterless printing offers a 20 percent larger colour space than conventional offset. Another advantage of waterless printing is reduced dot gain and more consistent colour. Conventional offset printing requires balancing the fountain solution with the ink which is naturally detrimental to the quality of the printed piece. This is because the fountain solution dilutes the ink and causes the printed dots to soak into the paper and spread. This inclination for dots to spread in size is called dot gain. Because there is no fountain solution used in waterless printing, dot gain is reduced significantly. 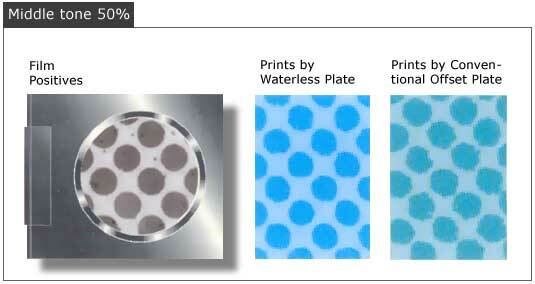 Notice how the dots rendered with a waterless plate are much sharper than those printed conventionally. Contract proofs are press-matched, ICC profiled and colour managed using Heidelberg’s award winning colour management system to ensure there are no surprises when the job goes on the press. The ability to print short runs cost effectively allows easy versioning of a full colour job aimed at specific markets and then run the job again at a later date with a new or altered message, aimed at a different audience. The ability to do this has not been lost on companies who live in a constantly changing market where demographics and trends shift almost daily. The QMDI PRO is truly an offset press for these digital times. Samco Blog: What is Thermography Printing? Copyright © Samco Printers Ltd. All rights reserved.